Have you bothered by the problems of tooth decay, bad breath or cigarette stain? The electric toothbrush can help you solve the problem. Besides, it works in five modes of Standard, Clean, White, Message and Soft. Satisfy your various needs. Standard, Clean, White, Message and Soft working modes provided and it can be adjusted from weak to strong force. The device will stay the default working mode and working force which you used last time. Allows for 3 months&apos; stand-by time after 3 hours&apos; charging. Occupied with soft bristle and middle bristle. Satisfy your daily needs. 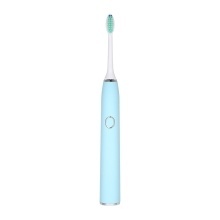 The electric toothbrush provides comfortable hand feeling and sense of beauty.